First weekend of Blogvent! Okay, so it's only been one day but December does seem quite alarmingly short, especially as my daughter has her birthday this month too. We need to start writing cards these weekend and posting overseas stuff. Yikes. Let's crack on! 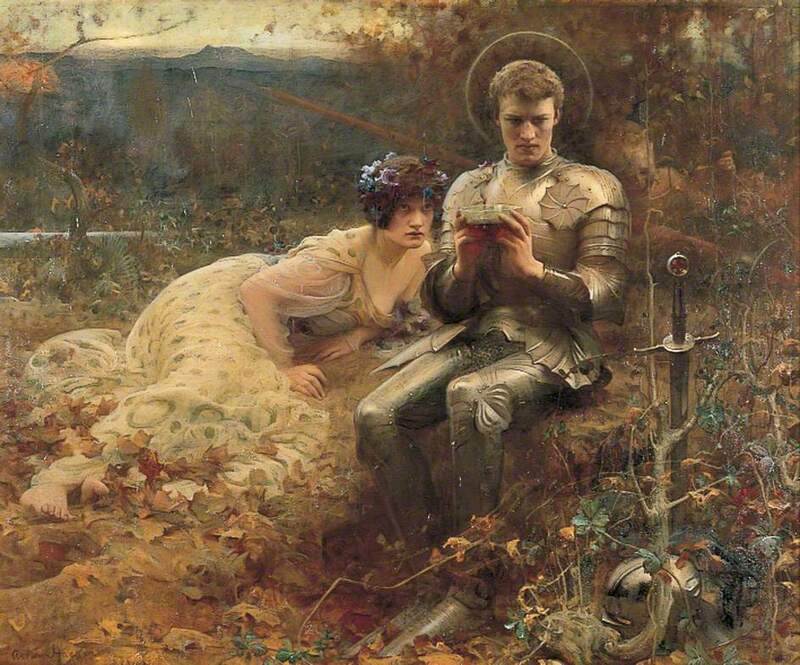 Oh, I know, we all love a nice bit of Arthur Hacker (1858-1919) and his smashingly gorgeous paintings. This one is no exception. 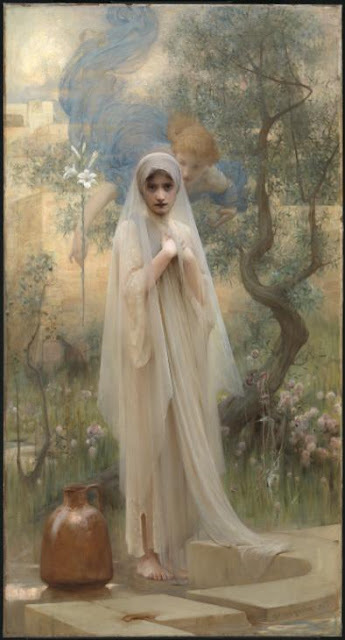 We have a pale wisp of a Virgin Mary collecting water in a garden. Fluttering down from heaven and whispering in her ear is the lily-waving angel. That is a very pointy lily, a bit like a biblical cupid's arrow. 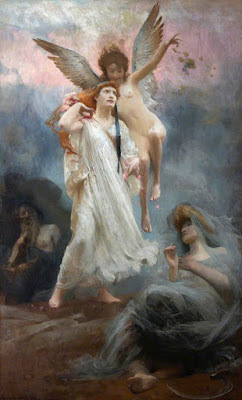 Mary looks a tad distracted, I suppose the idea is that the angel is invisible and she can only hear the faint whisper. Lesson number one is don't surprise anyone by a well - startled virgins tend to topple down them. Hacker studied art in Paris and although he is often called a Pre-Raphaelite follower, it's due to his subject matter rather than realism. There is something delicious about the creamy perfection of his figures and he is a painter who enjoys doing a lady, if you excuse the phrase. Even the very modest Mary is wrapped in diaphanous layers that are as revealing as they are concealing. The reason I loved Hacker is the inadvertently hilarious The Temptation of Sir Percival, or as I like to think of it - 'No I won't share my packed lunch!' By the standard of Hacker's other women, Mary is a slight little thing, childlike and timid. He normally likes a big-bottomed wench in a jolly frock, and rightly so. By contrast, his little Mary has a vulnerability that makes you think she really isn't ready for all that celestial whispering. According to the Tate website, under x-ray, they could make out another figure in the background, another woman at the well. However, I think her isolation makes the image stronger. In this picture Mary is being chosen for something that will isolate her, for better or worse, for the rest of her life.